Keep your eyes peeled for monthly e-blasts hitting your inbox the first week of every month. Have an event you want to share with provincial members? Send us an email before the 25th of the month to have it included in the next e-blast! Love to Insta? Your SPC Ontario team has a brand new account to help share our sport physiotherapy stories. The Sport Physiotherapy Canada – Ontario Section (SPC- ON) Executive has been hard at work to develop a $200.00 cash merit award to encourage and reward our student members for their participation in sport throughout the province. To recognize Ontario physiotherapy students who demonstrate promise and a desire for involvement in Sports Physiotherapy and event coverage. This award is also to help provide support to new graduates to maintain their Sport Physiotherapy Membership after graduation and to assist in initiating their participation in the credentialing process. We are currently hard at work planning course and events for the 2018-2019 calendar year and are looking for clinics willing to host us! Your space should be available Saturday and/or Sunday, have open space and enough therapy beds to hold a minimum of 10 participants. Some courses may require bigger spaces so please let us know if your clinic is able to host a large course! If interested, please contact us at ontario@sportphysio.ca to have your clinic’s name added to our list! Do you work with an amazing SPC Ontario member? Or are you a member that is doing something different, amazing and interesting? We are looking for members interested in being featured in our “member spotlight” to be posted on the website and through social media portals. Please email us pictures and a brief bio describing why your work should be highlighted! IFSPT’s Third World Congress for Sports Physical Therapy. Join us in Vancouver in October 2019! Check out the event link! October 4-5th 2019 at the Vancouver Convention Centre. The extreme mobility and strength demands of gymnastics convey a unique challenge to athletes who strive to achieve great range with precise control. Because it improves their core power and alignment, Pilates training can help athletes perform better and prevent injury. They gain better posture and movement control. 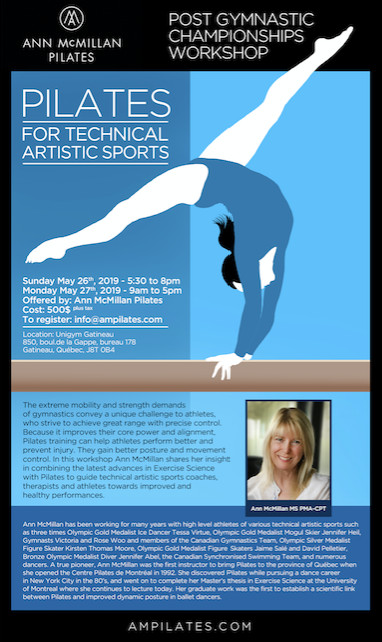 In this workshop, Ann MacMillan shares her insight in combining the latest advances in Exercise Science with Pilates to guide technique artistic coaches, therapists and athletes towards improved and healthy performances. From diagnosis to treatment, including running gait analysis/retraining, detailed footwear analysis/prescription and appropriate load management… everything is presented in a structured way to ensure that registrants can readily apply learnings with recreational runners and athletes. Members of Sports Physiotherapy Canada (SPC) qualify for a 15% discount ! Download the course poster here. 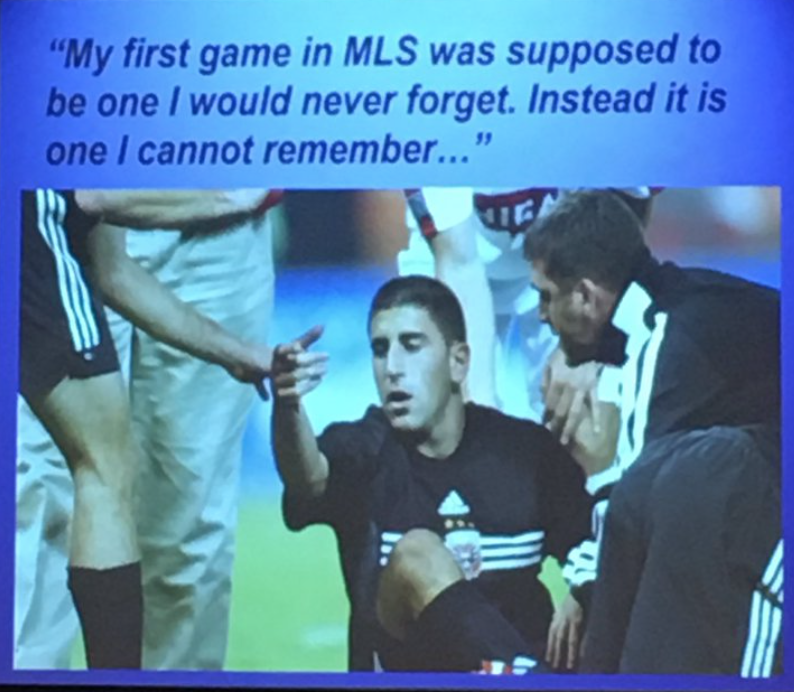 The Canadian Academy of Sport and Exercise Medicine (CASEM) will be hosting their annual symposium from May 16, 2019 to May 18, 2019 at the Westin Bayshore in Vancouver, BC. We are pleased to offer you easy links to websites you may find useful for sport physiotherapy and field coverage! Canadian Center for Ethics in Sport (CCES): The CCES is an independent, national, not-for-profit organization. We recognize that true sport can make a great difference for individuals, communities and our country. We are committed to working collaboratively to activate a values-based and principle-driven sport system; protecting the integrity of sport from the negative forces of doping and other unethical threats; and advocating for sport that is fair, safe and open to everyone. World Anti-Doping Agency (WADA): The World Anti-Doping Agency’s mission is to lead a collaborative worldwide movement for doping-free sport. Global DRO: The Global Drug Reference Online provides athletes and support personnel with information about the prohibited status of specific medications based on the current World Anti-Doping Agency (WADA) Prohibited List. Your SPC membership comes with a ton of perks! Click here to see all of them. Receive a free SPC Member t-shirt when you order your fully stocked sling bag! Have a question or a great idea for your executive? Would you like to be more involved in SPC but are not sure where to start? Covering an event? Show your SPC pride! Are you headed out to the field to cover a local or international event? Share your adventures with fellow SPC members by using our hashtags!